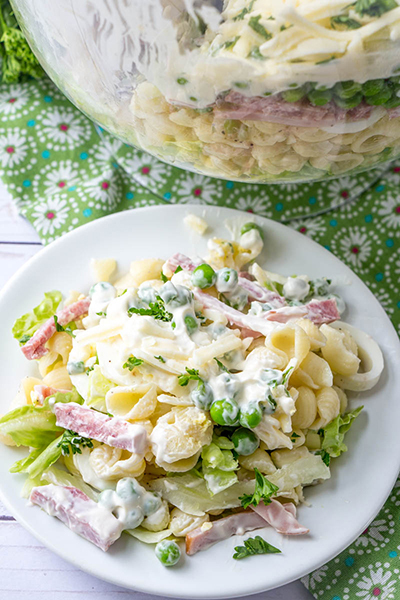 Gorgeous Make-Ahead Eight Layer Salad recipe for the most foolproof, colorful salad great for entertaining, potlucks, or summer picnic side dish idea! It is so easy and you can make it ahead of time. I have an awesome new recipe to share with you today just in time for Father’s Day this weekend. This Make-Ahead Eight Layer Salad is a recipe I’m actually really excited about because I’m a nerd who loves layered salads made in trifle bowls. They look so pretty, don’t they? Things have been so hectic around here lately. I know I haven’t had many new recipes coming your way, but I’m doing my best! My sweet, precious little daughter was born on May 27th at 7:44 a.m and was three weeks early. She had quite a few complications during and after the birth and I did, as well. She was a big girl weighing in at 8 pounds and 12 ounces….at 37 weeks gestation! That is unheard of, right? Today was her official due date! My dear Eliza Rose decided she was going to be an “enormous” baby according to my OB/GYN and therefore had trouble coming out. She had what was called Shoulder Dystocia where her head comes out but her shoulder gets stuck behind my pelvic bone. Ouch for both of us! Believe it or not, shoulder dystocia only occurs in 0.58-0.70% of vaginal deliveries and it can be really dangerous for mom and baby. She had the cord wrapped around her neck and even after that was cut, she eventually came out not breathing. It was so scary (especially for Mr. Wishes as I was kind of out of it and unaware of everything going on around me)! I don’t even like to think about it! All I know is God showed us mercy and protected us both from what could have been a way worse situation. He wasn’t going to let anything happen to our sweet girl we already loved so much for 37 whole weeks. The actual pushing time for Eliza’s birth was 3 hours and 15 minutes and I used up every ounce of my energy and more to get her out. I would say I was in the negative as far as energy goes! I never even knew you could feel that physically and mentally drained at the same time. I’m happy to report that we are both doing well now. Mommy is recovering from some issues with my leg from the birth (as in it still feels kind of like rubber and is a bit weak), but we are slowly adjusting to our new normal here at home. Any suggestions for getting a nocturnal baby to sleep at night instead of during the day? If you’re just here for the food, this Make-Ahead Eight Layer Salad is awesome for those summer BBQ’s and picnics. 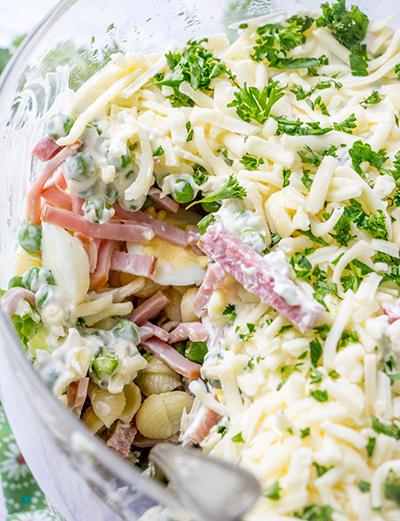 I can tell you right now that this salad will make numerous appearances at our family gatherings. Father’s day is coming up and we all know dad’s like to have some meat in their salads so this one will be perfect (which is why this Cashew Chicken Rotini Salad is also a great idea). You can feel free to use any meat you want in this Eight Layer Salad. Bacon would be wonderful! Speaking of bacon, you should also try this Avocado BLT Pasta Salad. You can’t go wrong with bacon in a salad. I’m also partial to this Chicken Club Sausage Pasta Salad if you like pasta salads with meat in them. I hope you make this at one summer gathering this year and get ready for everyone to ask you for the recipe. Everything looks more impressive in a trifle bowl where you can see all those beautiful layers! I have a bunch of side dish recipe ideas you can feel free to look at. Enjoy! Check out my how-to video of me making the recipe for this Make-Ahead Eight Layer Salad! Cook pasta according to package directions; drain and rinse with cold water. Drizzle with oil; toss to coat. Place the lettuce in a tall 2-1/2-qt. 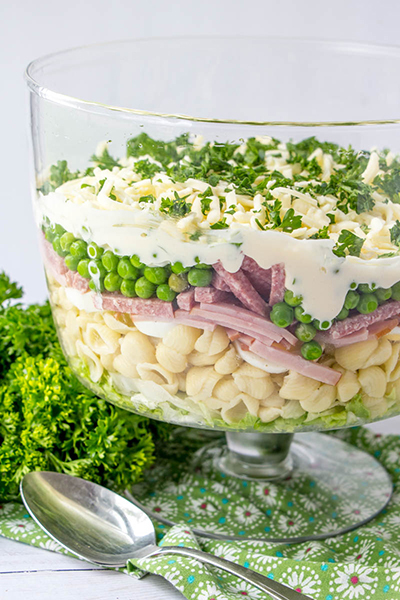 glass serving (ideally a trifle bowl) but you can also use a large glass bowl; top with pasta and then sliced eggs. Sprinkle with salt and pepper. 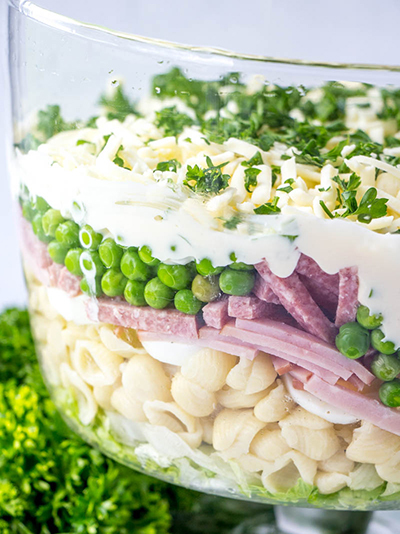 Layer with ham, salami and then peas. Combine mayonnaise, sour cream, green onions and mustard. Spread over the top. 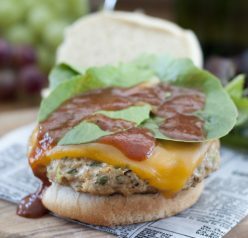 Cover tightly and refrigerate for several hours or overnight for best flavor. 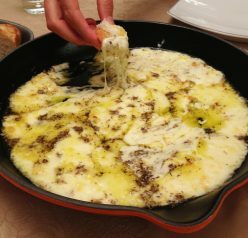 Sprinkle with cheese and parsley before serving. Enjoy! Love this and it looks so pretty! Congrats on Eliza Rose! She really knows how to make an entrance, doesn’t she? SO glad you’re both doing well — that sure wasn’t easy for either of you. Anyway, also glad you’re sharing this wonderful salad with us! Perfect for salad season. Thanks! Could you also use shoe peg corn? You also need to blot lettuce and get all water out of lettuce. I also sprinkle season salt and fresh chopped tomato when serving. 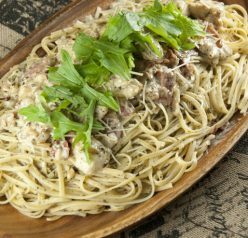 It is so good – a family favorite!! This is actually an old recipe my 93 year old mother used to make for family picnics! It was 7-layers back then and as a kid I loved it! You could probably change it up a thousand different ways! Thanks for the memories! 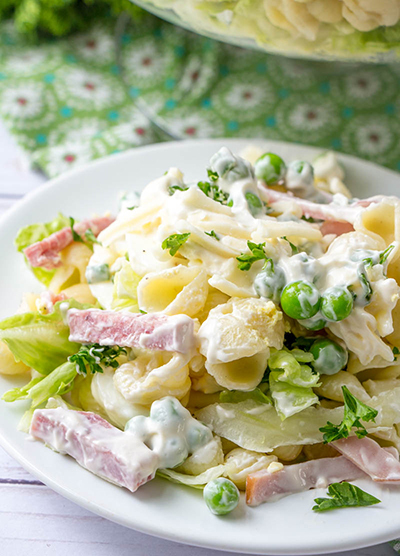 So many great flavors in this salad and it’s make-ahead, too! This is always a hit at parties. This is a great recipe for entertaining. Layers and layers of goodness. So GOOD! 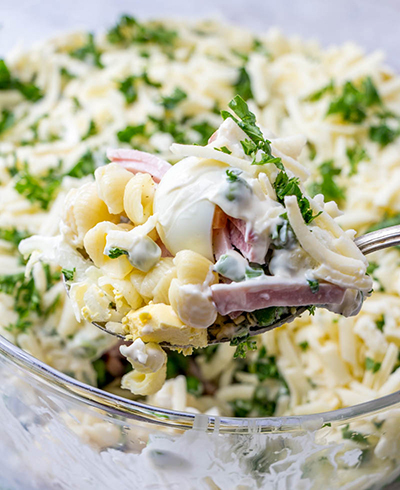 This is such a fun salad for gatherings. Thanks for the recipe! 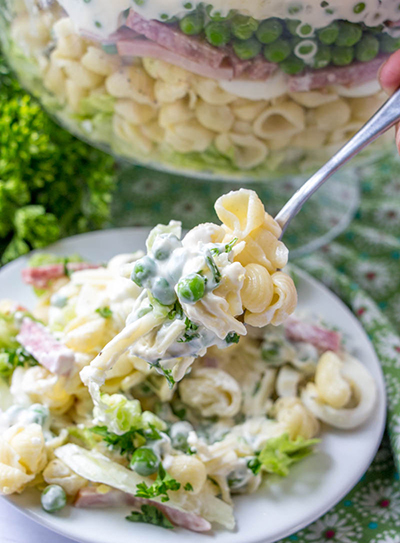 Perfect salad to bring to a potluck because everyone always oohs and aahs and how pretty it is! It’s such a pretty salad! Went over well at our dinner! I love all those flavors! My family enjoyed it, too! This is the best salad EVER! This is so great to bring to parties, everyone is always impressed! And it disappears quickly!